This video claims to show the Buk linked to the downing of MH17 being transported to Russia, with the transporter the Buk is loaded onto matching that seen in previous photographs and videos reportedly taken on the same day. This position was inside the rebel controlled city of Luhansk, around 50km away from the areas the launcher was reportedly sighted in earlier in the day, and around 30km away from the Russian border. But can we be sure this is correct? It seems that based on studying the information available about this site the Russians lied when they claimed the billboard was located in government controlled territory. It’s unclear if this is yet another example of the Russian government parroting internet rumours and theories as part of their official statements, but either way, it’s increasingly clear the claims are false. Nice summary. 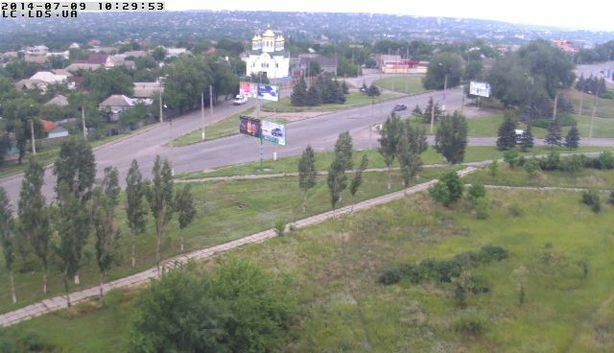 But just one little note: The webcams were shutdown by order of the ‘government’ of the selfproclaimed ‘Luhansk Peoples Republic’. It is well known to all who follows conflict that Rebels got Buk equipment from Ukr army and paraded it a lot in Luhansk some time ago, and this equipment was said by Ukr army and later by rebels as useless. 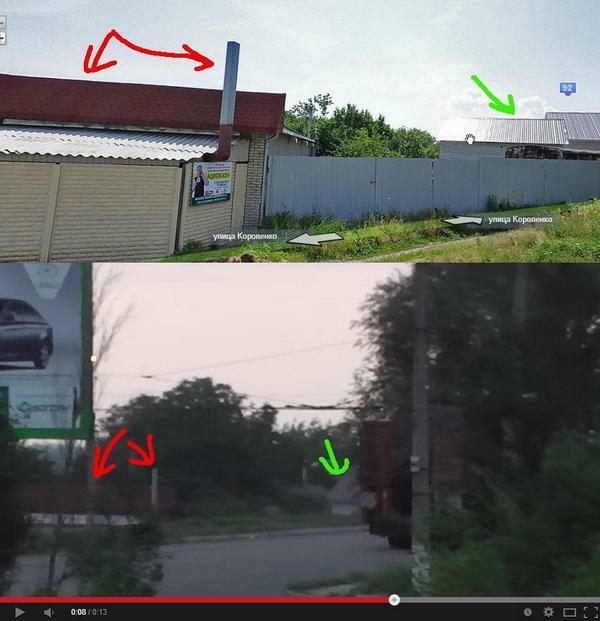 Anyway, is my understanding correct in saying that your analysis that video was likely shot in Luhansk, not Krasnodon? If so, in all likelyhood it has nothing to do with aftermath of the shooting; and in all likelyhood Avakov just lied. Apparently, the original statement said that the video of the Buk was taken on its way *towards* Russia and passed through Krasnodon. Somewhere along the line, it looks like it was mistranslated that the video being taken in Krasnodon when in fact they meant the video had been taken with the Buk headed that way. 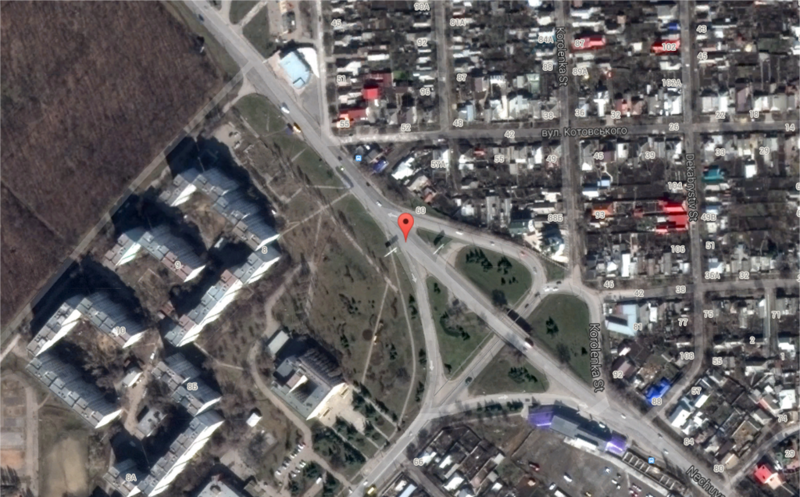 At any rate, it’s Avakov that provided us with the geo-graphic coordinates that placed the video in Luhansk. 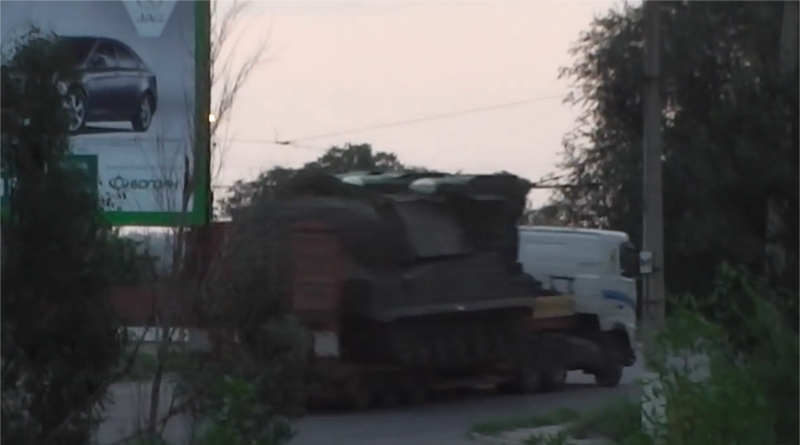 Also, the rebels did not capture the Buk from the Ukrainian military. I did an analysis of the image the DNR released of its “captured” Buk. The story isn’t legitimate because they were actually so lazy in cooking up the story, they didn’t even bother to take a new photograph of the Buk. The photography of their “captured” Buk was taken several years ago and posted online. There is actually no evidence the rebels ever had a BUK. US satellite imagery would have picked it up right away, and of course, they refuse to show what they have. Your blog entry is also very weak. You’re willingness to accept the denials of the Ukrainian authorities, when it’s now common knowledge that the rebels captured enormous amounts of trophies from the Ukranian military. Your faith in the American intelligence community is greater than my own and if you truly believe that Washington would have bothered to have satellites constantly snapping photos of Snizhne or the Donetsk regions to look for Buks when there are greater threats to American national security than the Russian military and pro-Russian separatists operating in Ukraine. A limited supply of satellites and oh so many pressing national security threats probably makes the need for taking photos of Donetsk and Luhansk a lesser priority for the U.S. Government when they can just dole out cash to commercial satellite companies to provide similar data. I think your distances are wrong. Worth pointing out, this place isn’t in Krasnodon as we were led to believe. Clear the Ukrainian authorities are trying to blame Russia for the mess in the East. All the governments involved should release their data. In this instance, it would be helpful to have verifiable evidence of when this footage was taken and to have the whole of it released. Stupid russians dont check information before lie: that cables from trolleybus, there is no trolleybus in city Krasnoarmeysk (controlled by Ukraine), that place is Luhansk (controlled by russian terrorists) where trolleybus runs. Yep, it’s 48° 1’1.38″N, 38°18’6.04″E, supposedly filmed at 11:40am on July 17th. Is it possible to check the video for consistency with weather for previous 3-4 days? And, at least to my naked eye, I can not see how many missiles. If 3, then 3 missiles in, 3 out – no launch. If 4 (and it can be assumed as 4), then one missile was fired => strongest evidence so far rebels fired it. Now, going back couple of days, AN-26 was shut down exactly in the area, allegedly at 6.5 km attitude (manpad not enough). I did not see any good pictures of the wreck, but some junk that I seen might be argued as shrapnel. So, if video is on June 17 => rebels fired a missile on this day; if the video is earlier => nothing so far. Looks weak, nothing lines up neatly. Why not send someone that takes a picture with the right angle. And what about the address of the car dealership? Why so far away? The picture published showing the whole of the car dealer’s billboard, shows that it has/had a large arrow and “1KM” of the left-hand side, pointing to the right. It’s not “so far away”. The address given on the ad is at the far end of the blocks of buildings from where the video was taken – i.e. off the bottom left-hand corner of the aerial view of the roads (near top of this page). This has been pointed out before, but isn’t included in the text above. You can also find the location of the dealer by Googling their phone number, which was on the ad. 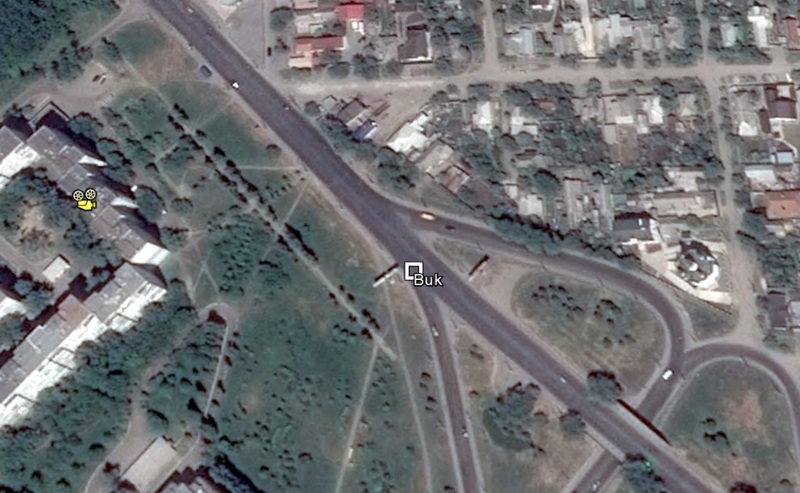 Where can I see these details on the sign in the video of the Buk on the truck rather than on the sign you claim to be the same sign in Lugansk? These green bordered car signs are all over Ukraine, it’s Ukraine’s locally based car manufacturer, Bogdan. here is my explanation of air traffic management systems and how the recording the RU MOD use shows nothing but the destruction of MH17. no SU25 to be seen. Then why doesn’t the Kiev government release the records of the air traffic communications between Kiev and MH17? The video https://www.youtube.com/watch?v=Q3MomxNHnUA&list=UUWRZ7gEgbry5FI2-46EX3jA is from official Ukranian Mililitary channel at 4minutes 47 seconds and later show Buk 11 M1 operating by Ukranian military, supposedly at 16.07.2014 in the area. It will be interesting to geolocate it, and match to striking distance and alleged by Russian positions. On topic: Why would anyone rent a billboard in the same town, isn’t it wiser to advertise in surrounding towns? It makes no logical sense from Russia to say that this advertisement exists only in the same town as the dealer. It’s simply misplaced a little bit, at the wrong corner of the building where it is made from. But it is of good quality and you can recognize exactly the same structures as in the video, e.g. the small houses in the background and others.